Mango Ice-cream with tropical fruits will give amazing flavour of mangoes and fruits to make you refresh in the summer mango season. Make this recipe at home and give a small surprise to everyone. 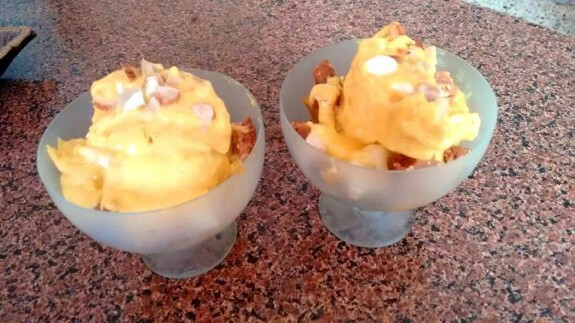 You can get the Mango Ice-cream recipe in my other post. 1. Peel all the fruits and cut into small pieces. It would be better, if you keep all the fruits in the refrigerator at least for 1 hour before making this dish or before cutting all the fruits. 2. Now take 2 ice-cream glasses and place the cut fruits equally on both the glasses. 3. Add some chopped cookies, choco chips. Chopped dry fruits and honey. 4. Now place 1 big scoop of mango ice-cream on top of the fruits on each glass. You can add more chopped cookies, chocolate chips, honey and dry fruits on top of the ice-cream too. I am a Computer Engineer by..